This post is for As the Mind Meanders. 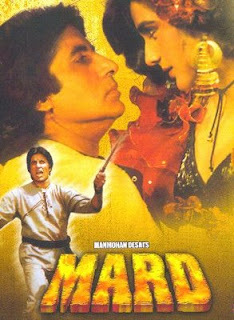 I don't personally agree that Mard-The Amitabh-Amrita Singh starrer was a great film. But my friend has seen it over and over again. Well, to each his own. This film though, is special to my mother if not dad so much. I was told that in early November, 1985, my parents decided over a long distance phone call [24 years ago making a call from Bombay to New Bombay required STD connections! I am ancient!] to go watch the film Mard. My mother who was heavily preggers with me, happily agreed. Two reasons; she would get time to be with my father and watch Amitabh. She was and is an ardent fan. She wouldn't miss a single film if given a chance. So they were supposed to see the film on 17th November. Tickets were booked and plans were made! My dad would travel all the way from Andheri, pick her up and go to some cool theatre in town [South Mumbai is town]. But destiny had other plans. Leena's [mom] tummy starts aching. My nani dismisses it as tummy burn or something. This is so because my mum had already raised two false alarms. First time you see! But the pain only increased. Nani said to wait. Nana had panicked and Mum wanted to go to the hospital. By now, Nani and Ma decided it was indeed time. On the other hand Subir [dad] was at the cargo complex, working late as usual. Nana called Papa and told him that Leena is going to the hospital. Don't worry and finish your work [poor dad!]. Ma and Nani go to Pai hospital and have Ma admitted. Nana falls asleep at home due to too much tension. Doctor Pai is summoned. He rushes in, with one cheek unshaved. There are 11 other expectant mothers in the same ward as Ma. Enter Nikita Banerjee into the big bad world! Lolz. Lolz. Ma later told me that she was esctatic yes but had to miss the film! She would tease me saying that she had to miss the film because of me! Couldn't I come in when I was supposed too? [that would have been early december or so!]. Another thing. I think I triggered off something. Because afterwards 11 babies were born in the night. Imagine the poor doc's plight! 11 girls and one boy! whoa! wow thats really lovely!!!! tell leena aunti it was much worth missing the movie Mard cause she got an angle against it.........now thats a smart deal. aww so cuteeeeeeeeeeeeeeeeeee.!!!! i never knew this! Thank you Thank you! By the way I have seen the movie once or twice! Lolz. Yeah I am glad I am not a boy! Thanks! I don't know about the doctor yaar! Lolz. Poor him! You should treat your mom to that movie!! Loved the lines where nana slept because of too much tension..when my daughter was being born..my hubby could not stop munching nuts and waht not..it irritated me to no end!! Talk about handling stress!! My mom has seen all the tall man's films time and again! Hehehe. You know my dad was so excited that he went and got a huge blue teddy bea and when he came to see me...I was so tiny! I played with the bear for 6-8 years! Btw..know which was the first movie after marriage my ma and pa saw? So much for a romantic film.. Heh! ekdam filmy entry lag rahi hai!! Yes I am a drama queen! My three-year old nephew has learnt this dialogue! lolz And about me...I am hatke! I don't mind giving out my right age! Sadly I don't have many memories of Nana as he passed away really early in my life. But he was nice. I like the chandler comparison! Thank you! Keep visiting. And the film is really cheezy! Worst is the title song! Thats a real sweet story...one cheek shaven doctor?? exaggeration?? Don't bother watching the film. It is silly. Thanks for dropping by! Lolz poor you! And I ain't exaggerating the doc's plight! Wow. This is some tale! Wish mine was such a dramatic entry! Cool blog and thanks for following! I liked this post very much.I am a very big fan of Amitabh Bachhan and I have not missed a single movie infact watched all movies may be twice or thrice.Mard movie is also good may not comparable with other brilliant movies. Thank you for dropping by! I have seen all Amitabh's films too and have enjoyed them. Mard is bad compared to the others! you got it so detailed,as if you was enjoying it within ! ha! you have narrated as if you had a camera( HD Camcoder) installed , all along as these incidents were unfoalding and later you downloaded it to your memory card inside your brain.